When British forces arrived at Mobile Bay to assault Fort Bowyer on Mobile Point, half of the British army under the command of Sir John Kean, who was recovering from wounds suffered during the defeat at New Orleans, was landed on Dauphin Island to act as a reserve during operations against the Americans. Two days after the surrender of Fort Bowyer, the British warship, HMS Brazen arrived at Mobile Point with word that the United States and Great Britain had agreed to peace terms at Ghent, Belgium ending the War of 1812. British commanders withdrew their troops from Mobile Point and moved them, along with their American prisoners, to Dauphin Island to await word of the treaty's ratification by the U.S.
2. View of marker, among others, at Fort Gaines. with fish, which were "...in plentiful supply..." and resorted to killing and eating alligators, which one British officer described, "... the meat was white, and the flavor like coarsely-fed pork..."
To ease the boredom during their stay on the island, British officers erected a theater named the "Theatre Royal" Isle Dauphine" and produced plays with titles such as "The Apprentice" a "Song by Mr. Steel, and "Prime, Bangup" by Mr. Hill” and "...the most Tragical Tragedys called Crononhotonthologus." When word arrived of the ratification of the Treaty of Ghent in March, British forces began to leave Dauphin Island. On April 5, 1815, the last British troops departed the island and returned to Great Britain. Erected by the Major Uriah Blue Chapter of Lower Alabama, United States Daughters of 1812, National and State Societies, U.S.D. 1812; the General Society of the War of 1812 in Alabama and the Sons of American Colonists. Marker series. This marker is included in the Daughters of the American Colonists, and the United States Daughters of 1812 marker series. 3. 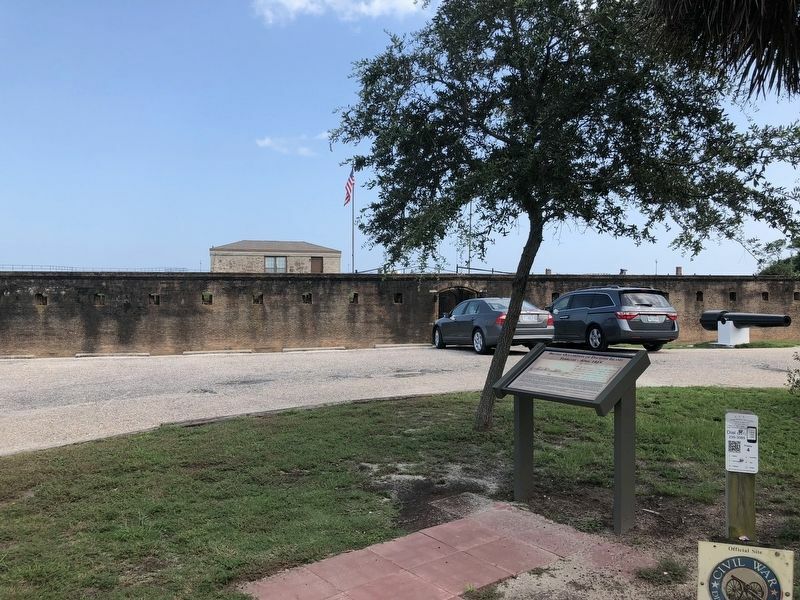 View of marker with Fort Gaines in background. east. Touch for map. Located in the parking area of Fort Gaines. Marker is at or near this postal address: Bienville Boulevard, Dauphin Island AL 36528, United States of America. Touch for directions. Other nearby markers. At least 8 other markers are within walking distance of this marker. 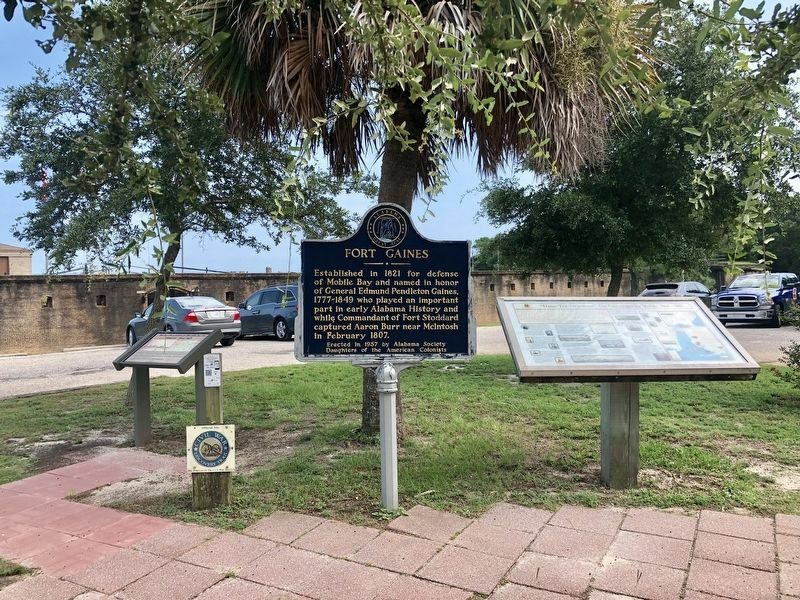 Fort Gaines (here, next to this marker); 19th Century Shipwreck (within shouting distance of this marker); Storm Clouds Gather (within shouting distance of this marker); "To Be Blown To Kingdom Come" (about 300 feet away, measured in a direct line); Anchor From U.S.S. Hartford (about 300 feet away); "Save Your Garrison." (about 400 feet away); Energy from the Sands of Time (about 400 feet away); “Damn the Torpedoes!” (about 500 feet away). Touch for a list and map of all markers in Dauphin Island. More. 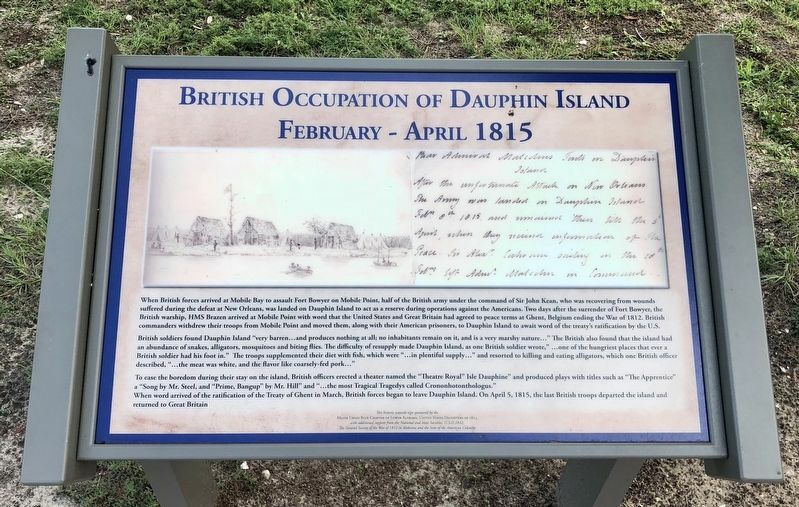 Search the internet for British Occupation of Dauphin Island. Credits. This page was last revised on August 25, 2018. This page originally submitted on August 25, 2018, by Mark Hilton of Montgomery, Alabama. This page has been viewed 66 times since then and 14 times this year. Photos: 1, 2, 3. submitted on August 25, 2018, by Mark Hilton of Montgomery, Alabama.